Nos.30 & 28, Fore Street. The house, now made up of April and The Garden Cottages, was probably built as a small farmhouse during the prosperous times of Ottermouth port in the late 1400’s. 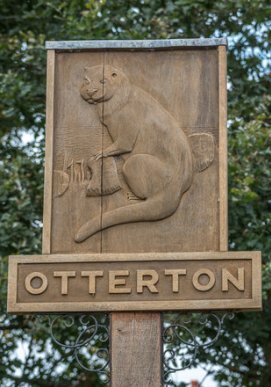 Otterton today has survivors of that period in Anchoring and Houseterns Farmhouses; Horestones at Pinn; Pitson and Pavers Farmhouses. April/Garden was a 3 room through passage house, with open fire in the main hall and has blackened roof timbers. The earliest record seen is the 1779 Auction Prospectus for Otterton Manor thus:- Lease No 73 John Mayne, messuage and tenement 15 ¾ acres Rent 12/- pa. The lives were:- John Mayne 46, Mary Luckis, now Hooper 45. John Mayne died in 1781/85? 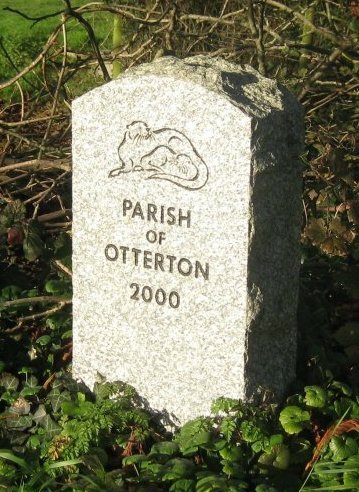 and by his Will left his leases in Otterton to his nephew Oliver Carter. John’s sister Susanna was married to Olivers father, John Carter of Harpford. Mary Luckis may also have been John’s sister. He and his father, John Mayne senr, had been holding leases in Otterton at least since 1737. John snr.was married to Agnes, who may have been a Luckis. Luckis Tenement, now Rydon Farmhouse, was held by the Luckis or Lucas family from 1707 (the date on the house lateral stack) and are named in Otterton in 1613 (Malt Book). John Mayne leased it in 1751. By 1779 it was held by Matthew Butson. Both the Mayne and Lucas families came from East Budleigh. Both are named on the 1524 Subsidy Roll and further Rolls during the 16th.century. There is a remote chance that the Lucas’ had April/Garden Cottage built. John Lukeys is named as importing goods into Ottermouth in 1318. Lucas were shipbuilders in Otterton in 1619. The Land Tax Returns from 1781 to 1832 indicate that one of the leases conveyed by the Maynes to Oliver Carter C/R No. Was known as Braddicks. This family are first mentioned in 1694 when William was appointed Churchwarden for Otterton. 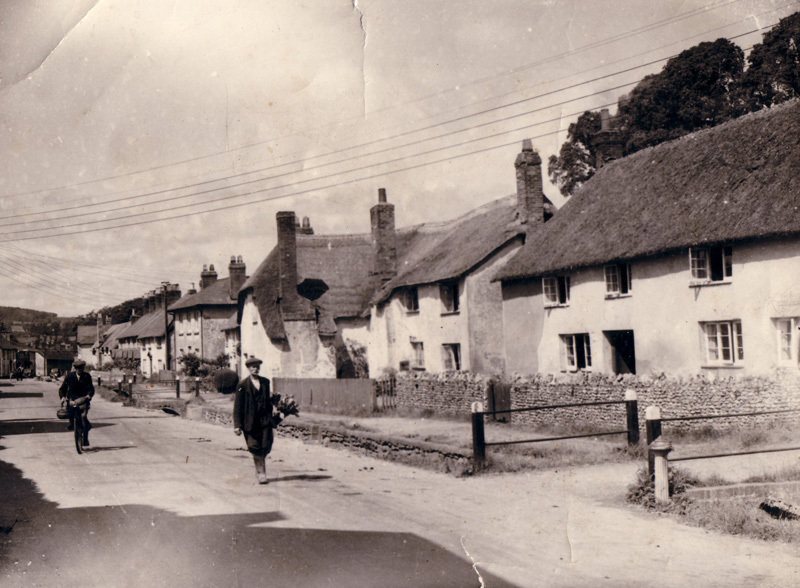 During the early 18th.century they held small farms in Pitson and Northmostown and probably also held the cottages in Fore Street. The 1790 Survey lists C/R 73 thus:- Oliver Carter a messuage and tenement, divided in 1801 15 ¾ acres. The dwelling house, barn, home orchard and Rydon orchard held by Oliver Carter and the other part of the house was let, tenant not known. The lives were members of the Carter family. Oliver Carter died 1829, and the cottages passed to Mary, his daughter, now Mrs. Oldridge. She died in 1841. Her tenants were Hermon Robins, farmer and William Sandford, tailor. The latter was living and had his shop in one half of the house to 1857. He was also Parish Clerk. Hermon Robins moved from the other half to Clapps (Basclose) by 1850. His father Richard Robins had been farming there from 1825. Hermon was followed by his brother Sherman until 1880’s. He was a wheelwright and carpenter, but was probably working for the Bakers wheelwright business at Bramley Cottage. The next record we have seen is the Estate Survey of 1911. Albert Smith is renting the building, which appears to be one house again (£7.6/3d). He is listed in Kellys Directory for 1902 as a market gardener and entering his daughter Olive at Otterton School in 1904. He appears in Directories to 1939 and to all accounts had a flourishing business with glasshouses on his land behind the cottages. Albert Smith died in 1954 (age 79) and his family continued to live in half the house, now known as “The Gardens” on the east side (1956/1961). The west side was known as The Cottage at this time, the Andrews family living there. The Smith family lived in The Gardens. The cottages were sold by the Estate in 1976 and Mr,& Mrs Ron Butler moved into the newly named April Cottage and Mr.& Mrs. Martin Perryman into The Garden Cottage. 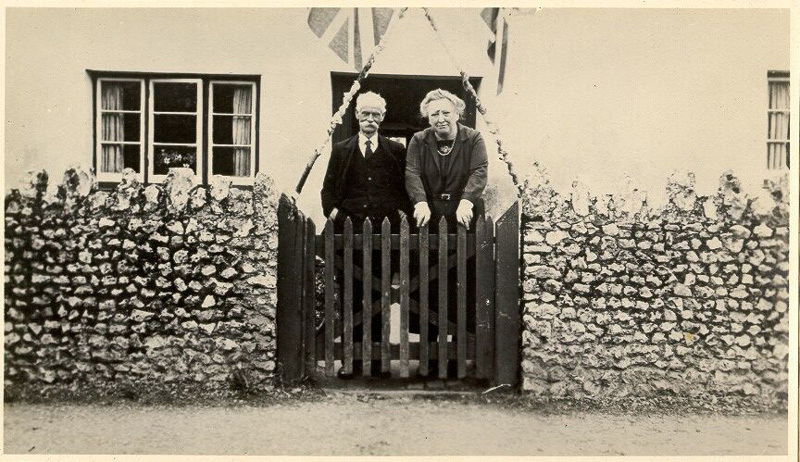 Albert George & Bessie Smith at the front gate of The Gardens now known as April Cottage.